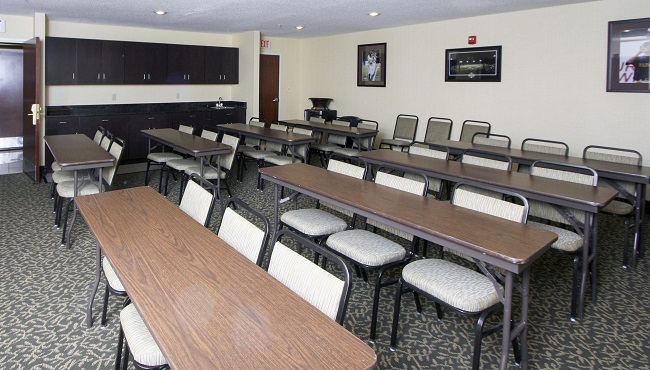 The Country Inn & Suites, Shelby, NC offers a comfortable meeting room with space for up to 35 guests. Reserve our 611-square-foot American Legion event venue for corporate seminars, board meetings, social events and more. Our friendly staff can provide tables, chairs and a projector screen, and free Wi-Fi is available for your attendees. Your guests will also appreciate our proximity to area restaurants and attractions like the Cleveland Mall, the Cleveland County Fairgrounds and the Earl Scruggs Center. One of Shelby’s premier event venues, the LeGrand Center is a local hot spot for weddings, corporate dinners, fundraisers, family reunions and more. Located one mile from the Country Inn & Suites, LeGrand offers three conference rooms, a boardroom, a ballroom and an exhibit hall perfect for extravagant events.